February 14, 2017, 11:46 a.m.
With lovebirds across the land preparing for their Valentines dates this evening, a new YouGov survey finds that most Brits have only told three or fewer people that they love them. Just over six in ten (61%) people have told one to three other people that they love them romantically. The single most common number of people to have said “I love you to” is just one person, at 26%. Unsurprisingly, Britain’s youngest people are less likely to have told many people that they love them, with 42% of 18-24 year olds saying having told one person that they love them and a further 19% yet to tell anyone. Britons’ love lists seem to stop expanding once they reach the age of 35. After this point, similar proportions of people in these age groups are about as likely to have said “I love you” to any given number of people. 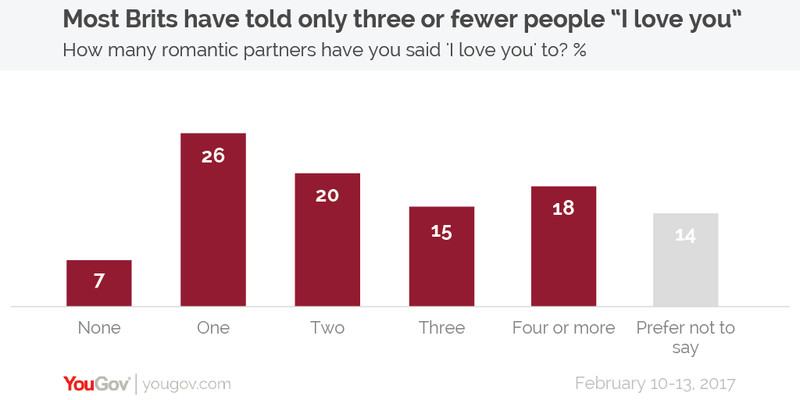 The British public are also unlikely to say “I love you” to Valentine’s Day itself. When asked how they felt about Valentine’s Day, just 4% of Brits say they love the celebration. A further 15% say that the like the day, but the overwhelming attitude of the public is one of indifference – 53% of people saying they neither like nor dislike Valentine’s Day. Only a minority of Brits will be getting into the spirit of the day and doing anything romantic. Of those people who are currently in a relationship, just 20% said that they would definitely do something romantic with their partner – less than half the number who said they definitely would not (44%). Likewise, just 10% of single people have a date lined up for Valentine’s Day – although a further 23% say they would like one. This could be because the British public overwhelmingly believe that Valentine’s Day is more about business than it is about people. As many as 87% said that they agreed with the statement “Valentine’s Day is too commercial”, (including 61% who strongly agree).